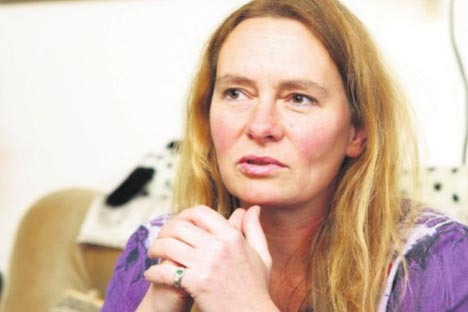 For ten years now, Slovak indologist Alena Adámková has been working in the distant lands of the Himalayan Mountains. That is where she directs an international foundation, research center and gallery which carry the name of Russian cult painter and philosopher Nicholas Roerich (Nikolai Rerich). The complex of eleven buildings, located in the Kullu Valley, spans an area of sixteen hectares and is officially known as the International Roerich Memorial Trust (IRMT). India has become the second home of this unique artist and thinker and his entire family. In recent days, Adámková received the highest award that Russia can bestow upon a foreigner – The Order of Friendship – for her efforts in preserving the Roerichs’ spiritual legacy, which is among the truly unique treasures of world culture. You are really a person with three homes, so let’s begin by clarifying what ties you still have to Slovakia? I was born in Slovakia and spent part of my childhood and adolescence here. My parents still live in Slovakia, and I love coming back here. I completed the first grade of primary school in Bratislava but immediately afterward, my family moved to Russia. My father worked at the Joint Institute for Nuclear Research (JINR) in Dubna, not far from Moscow. A radiological chemist and nuclear physicist. That was my first experience with Russia. After five years there, we returned home. I completed the seventh and eighth grades here and then went on to secondary school, located on Vazovová Street in Bratislava. Later, I completed post-secondary studies at the Osvetová (Enlightenment) School. At the same time, I devoted time to fencing. Yes, and I even fenced competitively at university, playing for Slávia UK [Comenius University]. I won a silver medal at the Czechoslovak Championships. That was my biggest success. Aside from that, I was active in the theatre company Ludus. Back then, more than a quarter-century ago, its director was a man by the name of Pavol Paška. Under his leadership, I tried my hand at dramaturgy. I had a growing interest in philosophy, however, and that led me to Russia, then Soviet Russia, for the second time in my life. In 1985, I began to study in Minsk at the local state university. What kind of philosophy could one study in Soviet Russia, or rather Belarus, at that time? I began with Greek philosophy but during my second year, I started to dig deeper, all the way to the very foundations. And, thus, I found my way to Indian philosophy. So it was really possible to do that in those days? It was possible, yes, but not without a great deal of difficulty. They wanted to kick me out of school several times. How did you learn Sanskrit? I began learning the language on my own, since it was not offered at the Belarusian State University. When I would travel home to Slovakia, it was always by train through Warsaw. There I bought my first textbook of Sanskrit in the Polish language. I learned from that book. And when I wanted to study the Bhagavad Gita, the sacred Indian text in Sanskrit, I had to first get special permission of the Dean and obtain ten other official stamps. They qualified their approval with the condition that I prepare a crushing critique of the work from a Marxist-Leninist perspective. Slovak scientist, specialist on India. Since 2002, she has worked in Naggar, in northern India – the second home of Russian painter and philosopher Roerich – as the curator and executive director of the international foundation and gallery that bears the artist’s name, the International Roerich Memorial Trust (IRMT). After completing philosophy studies at the Belarusian State University, she became a doctoral student at the Institute of Oriental Studies at the Russian Academy of Sciences. In 1993 she defended her doctoral dissertation on the idea of the unity of the microcosm and macrocosm in the traditions of Vedantic philosophy. She also worked at the Ramakrishna Mission Institute of Culture in Kolkata (India). Later she undertook academic research at the Nicholas Roerich Museum in New York City. She has published several books on the life and spiritual legacy of members of the Roerich family. She translates from Hindi and Sanskrit into English, Russian and Slovak. That is true. However, Gorbachev was a long way from us. Minsk was beyond the wind. I completed my studies, having earned the reputation of not having been sufficiently brought to heel ideologically speaking. Right before our final exams, officials from the Czechoslovak embassy in Moscow came to talk us into joining the Communist Party of Czechoslovakia (KSČ), with the promise of some interested job awaiting us at home. Apparently, they failed to convince you? I was the only one of the 60 Czechs and Slovaks, graduates of the philosophical faculty, who refused to fill out the application. A close male friend advised me not to return to Slovakia. Perestroika had not yet arrived in Slovakia, after all, and that I would feel a lot safer in Russia. Half a year later, of course, everything changed. Did you not consider going home? No, I would have stayed there regardless of the political situation, as I had already been offered the chance to pursue doctoral studies in Petrograd (Saint Petersburg), in addition to receiving an invitation from a local experimental theatre. So the theatre continued to attract you? I never abandoned the theatre, not even in Minsk. There, I was active in a popular youth pantomime group. In Petrograd, the Interior Theatre was garnering success, led by the well known director Nikolai Belyakov. There, interactive theatre was the name of the game. Many of his productions took place in memorial rooms honoring dramatists such as Pushkin, Nekrasov, or other classical Russian playwrights. I took on the role of assistant director. When and how did you become familiar with the work of the Roerich family? Sometime in 1987. In Russia, their philosophy had been on the banned book index for a long time. At the time of Perestroika, however, magazines began to publish the notes of the writer Valentin Sidorov under the title “Seven Days in the Himalayas”. As the first in Russia to do so, Sidorov began to bring to light the work of Nicholas and Helena Roerich. In October of 1990, he organised an international conference entitled “The World through Culture” in the town of Izvara, not far from Petrograd. Izvara was the site of the former Roerich family estate. Young Nikolai liked to draw there. That conference was a fateful moment for me. Sidorov invited representatives of various religions from around the world to the conference. The Buddhists were represented by an associate of the Dalai Lama, while others were there from the Ramakrishna Mission and so forth. Our theatre group staged a production which was a living illustration of a Roerich painting. We handed out vests featuring Roerich’s art to the guests, whereby they became participants in the performance. And that’s when it started for me. As I was reading names off of a list, an old Indian monk comes up to me, takes a look at me and asks if I’m Russian. No, I reply. Do you study Vedanta. Yes. He then asked me something else and said: You will come to India to visit me. After I returned home, the man sent me an invitation to India and six months later, I was on my way there. He was none other than the director of the Ramakrishna Mission Institute of Culture in Kolkata. He became my spiritual teacher. And so, on 12 January 1991, the birthday of Vivekananda, one of the greatest philosophers of India, my entire life was forever changed. I traveled to India. A month before, I had sent him a telegram: I’ll be arriving at such and such a time. Please wait for me. I never received an answer. Many close friends and acquaintances tried to talk me out of it: You’re crazy. You’re going somewhere and not even sure exactly where. What will you actually be doing there? No, but at the time I didn’t place too much importance on that question. It wasn’t until I was seated in the airplane that it hit me. Where I am going, I asked myself. I know nothing about this man, or his organization, or about Kolkata, or even about modern-day India. Ancient India, which I studied in school, was something entirely different. An Indian man was seated next to me. He must have had a sense of how I was feeling and struck up a conversation with me. I confided to him where I was headed and what doubts were plaguing me. He began laughing: I’m a doctor at that institute, he told me. One coincidence after another then? Sort of. You see, once our flight landed, I was met at the airport with a sign on which my name was written. How did they know of my arrival when my telegram did not actually arrive until two weeks later? I asked my teacher: How did you know? He just smiled and said everything was as it should be. Had you already met any members of the Roerich family by then? In 1989, in Moscow, I had met the son of Nicholas Roerich, Svetoslav, and his wife, Devika Rani, the famous Indian actress. Mikhail Gorbachev had invited them there. In April 1991, I traveled to Bangalore to be with them for two weeks. They told me about the Himalayan valley of Kullu and the settlement of Naggar, and what hopes they had for that place. Svetoslav reminisced about his parents, who had dreamt of seeing the name of the town changed from Naggar to Vivyanaggar, which can be translated as The City of Knowledge. At that time, I had different plans, and I spoke to Mister Svetoslav about them. Whatever he thought, he kept to himself. Ten years later, I started to turn that dream into a reality. I stayed in Kolkata until 1998. My teacher died that year, and I returned to Moscow. In 1999, our son Yaroslav was born to my husband and me. And in 2001, I was offered a job in Naggar. It apparently had something to do with the fact that Alexander Kadakin had become the Russian ambassador to India. He had begun to work actively on the idea of renovating and bringing back to life the Himalayan seat of the Roerich family. Why did he choose you for this project? They were looking for someone who was very familiar with India and Russia, Indian and Roerich philosophy, in addition to having good language skills. Didn’t they prefer an actual Russian for this position? They did, but apparently they did not find someone who met all of the qualifications. Nikolai Rerich (1874-1947) is also known throughout the world as Nicholas Roerich. In 1929 he settled with his family in the Himalayan valley of Kullu and lived there until his death. In addition to his own homestead, he commissioned the building of a picture gallery and a building housing the Urusvati Institute for Himalayan Research, which included departments of philosophy, archeology, history, ethnology, linguistics and botany. The co-founder of the institute was the artist’s wife, Helena, who contributed significantly to the seminal philosophical work Living Ethics. The institute’s director was their elder son, George (Yuri), who was a recognised painter in his own right. The youngest member of the family, the renowned gallerist Svetoslav (1904-1993), was also a gifted painter. Seventy five years ago, he founded and, for a number of years, directed the Nicholas Roerich Museum in New York City. Later he returned to his family in India. In some Russian-language materials on the Internet, it is mentioned that Svetoslav Roerich, himself, chose you for the role. In selecting a candidate, it seems they also took into consideration the original recommendation of Svetoslav Roerich. Suffice it to say that on 1 January 2002, I assumed my role with the IRMT as Executive Director. In what condition did you find things there? In rather a sad state. For ten years prior to my arrival, an elderly woman, a German, Sister Ursula had been looking after the place. But it was simply too much for a single person to handle. You caught a big break, it seems, after landing the job when the Indian government, as well as the Russian government, awarded some significant financial grants to the Institute. The former Indian Prime Minister Atal Bihari Vajpayee helped us a great deal. He provided us some funding, which we used to renovate what we could. You have to keep in mind that we’re talking about a complex that sits on an area of almost 16 hectares. We have a total of eleven buildings there. Government funding, while helpful, is not enough to meet our needs. Some private sponsors came forward, who gladly contributed to our efforts, bringing a proverbial share of grist to the mill. We were, therefore, able to renew our research and the publication of our findings. In the past, everything had slowed down – had in fact come to a complete halt. In 2003, we founded an arts school for children. Is it a school for the creative arts? We have six different programmes of study there. One is devoted to Indian classical music, another to Indian classical dance, and yet another to the fine arts. We also offer studies in theatre/drama, sculpting/carving and even printing. Today around 150 children attend the school, whereas we started with only twenty. We built a new building for them, and last year our first four students graduated. This is only one of the activities of the IRMT. Almost every month, we open up a new exhibition in our gallery. The year before last, the world media reported that the gallery had been robbed. What actually happened? Nothing much really. A small amount was stolen from the cash register, but the thieves did not even touch the artwork. But it underscored the need to install an even more modern alarm system, which has been done. Do you have any plans to prepare an exhibition of Roerich’s paintings in Slovakia? Someone else would have to express an interest in such an initiative. The paintings, however, would not need to be transported from our Himalayan gallery. It would be sufficient to bring some from Moscow, where there is also a permanent collection of his work. A few years, ago we arranged for 45 of Roerich’s paintings to be brought to Delhi from Moscow. It was the first time in history that paintings of Roerich’s from our gallery and from Russia were exhibited together. At the Urusvati Institute, founded many years ago in the Kullu Valley by husband and wife Nicholas and Helena Roerich, there was a department of Tibetan medicine. Does the IRMT continue in its research of that subject? At present, we are just beginning to renew our efforts into this area of inquiry. Some research has begun concerning the etheric herbs which grow in the Himalayas. You reportedly have as many as 100,000 visitors to Naggar each year. Is that correct? No, not exactly. At most, more like 60 to70 thousand. This number could certainly be higher, as interest throughout the world is extremely great. However, in the Himalayas, the strict weather conditions are a limiting factor. The tourist season runs from April until June. Then the rainy season arrives. October and November are also suitable months for visitors. Then comes winter, during which time very few people dare to visit Naggar. What do you do there during the down periods? We don’t really have those. The only opportunity we have to travel back home is January. While, in fact, the worst time to take a vacation, it’s really my only option. Your husband, Oleg Martynov, is a Russian documentary filmmaker. Together you traced the footsteps of husband and wife Nicholas and Helena Roerich from their famous Central Asiatic expedition. What did you take away from that journey? Accompanied by my husband and our son Yaroslav, I spent time in the western and eastern foothills of the Himalayas, in India and Mongolia, in the Altai region and in America. With the exception of China and Japan, we went everywhere. We were able to gather a lot of unique material. For how long have you come to Bratislava this time? Only for four days, unfortunately. Do you keep in telephone contact with your mother? Most of the time we just email each other. I keep insisting that she comes to visit me but, so far, she hasn’t mustered the courage. It’s not only the plane trip to Delhi. From there, you have to endure another 16-hour bus trip to the Himalayan Mountains. Are you the only Slovak indologist working at this time? I can’t say that for sure. However, when the president of India visited Slovakia in 1996, I was the only Slovak indologist invited to attend. I had an audience with the president. Why, in your opinion, is there such little interest in the study of Indian languages and Indian culture? I don’t understand it, really. After all, interest in all sorts of mystical subjects is quite popular in Slovakia. Books devoted to Indian philosophy sell well, even though the translations are pretty horrible – mostly from English or German. In comparison with the original texts, they tend to be distorted. Seven years ago, your Slovak translation of the Bhagavad Gita: Song of the Lord (Bhagavadgíta, Spev vzenešeného), the sacred Hindu text, was published. One reviewer called its publication a highpoint for Slovak culture. I was thrilled that the book came out. It was the culmination of many years of intent and focused work. Through it, I also was able to fulfill the wish of my spiritual teacher from Kolkata, who had encouraged me to work on the translation. A bit earlier, I had translated into Slovak a collection of Hindu-Vedantic philosophy. It was published under the title Lead Us from Darkness into the Radiance of the Light (Veď nás z tmy do žiary svetla). I have never met either of them. Although both of these top leaders of the Russian Federation have since visited India, they did not make it to Naggar. This is quite understandable, really, given that we are located in the mountains, out of easy reach. Transporting such important guests to such a place is not very common or reasonable, particularly from a security standpoint. It is more likely that the ambassador in India is the one who mentioned my work in Naggar to the Russian leadership. What is the position of other Russian institutions toward the Roerich family and its spiritual heritage and legacy? Have opinions changed from what they may have been in the not-so-distant past? Of course. And I will venture to say that Roerich philosophy is becoming an alternative to the Russian Orthodox religion. The Orthodox hierarchy, in fact, seem to look upon it with resentment. In fact, some more radical voices have been heard talking about the spread of destructive occultism and sectarianism. Yes, some Russian Orthodox officials and theologians have objections to Roerich philosophy. Sometimes, if a person doesn’t understand something, if he can’t comprehend that versatility is possible in both thought and action, then the result is often to accuse someone who does possess this trait of devilishness, and to unfairly ascribe all sorts of negative attributes to that individual. That is often repeated but unsubstantiated nonsense, which has been circulating for decades. It’s simply not possible to put Nicholas Roerich and his work into a box and assign a simple label to it. Not only was he an esteemed painter, but he was also a world traveler, philosopher, thinker and peace activist. He was a Russian, but India became his second home. He found patrons and close colleagues in America, as well, exchanging letters with President Franklin D. Roosevelt, for example. That seems strange to some people. They accuse him of spying for the Soviet Union, despite the fact that as an author he was banned there for a long time. At the same time, average Russians have an affinity for Indian culture, enjoying, for example, Indian movies which Central Europeans don’t really embrace, to put it mildly. Why is that? In searching for an explanation, it’s best, perhaps, to start by examining our common spiritual foundation – in Eastern spirituality. No doubt, you have heard the opinions of some eminent minds who argue that humanity’s revival will take place in India and Russia. Because modern Western civilisation has exhausted its potential? Do you believe that? It’s not a question of belief, but of the logic of things. How do you view Slovakia and Slovaks from the Himalayas? How have we developed over the years and what direction are we headed in? People in Slovakia for the most part live rather superficially. What’s needed is a search for life’s purpose and meaning at some deeper level. Have we fallen victim to consumerism? When one stops to consider it and sees how children in India are dying for lack of a piece of bread, while here so much food is being wasted, the realisation is very troubling to me. Does the philosophy of the Roerichs (husband and wife) contain any trappings of religion? No, Roerich communities do not practice any activities of that kind. No rituals, masses or prayers. Followers of their teachings limit themselves to the study of the seminal work Living Ethics, which is also known under the title Agni Yoga. I have translated Helena Roerich’s four books into Slovak. Can you summarise the main tenets of the teaching? Agni in Sanskrit means fire, spiritual fire. According to Helena Roerich, it is “the synthesis of all yogas”. In keeping with the Living Ethics, there lies a “subtle” or “psychic” energy in the foundations of the world. A thorough knowledge of this energy is a thing of the future, of some future science, and will not come about through religion. In fact, it assumes the merging of science, religion and artistic expression into a single integrated system that is constantly evolving. It is said that the texts of the Living Ethics can serve as a guide on how to live? So how should one live? The basic recommendation lies in the overcoming of egoism, in the acquisition of science and art, in the development of inner tolerance and outer activity. In comparison with other schools of spiritual instruction, this one places a greater emphasis not only on moral development, but also on education and study that keeps in constant contact with the arts, and with the work. It’s not polite, I know, to ask about your own religious affiliations. So you may choose not to answer, if you wish. Why not? I was not baptised in Slovakia due to the prevailing social norms. While in Russia, I decided to be christened in the Orthodox Church. And in India, I was accepted into the Ramakrishna Mission. Does it all blend together? Do you see any major differences among them? No. Nicholas Roerich taught that white light has seven different rays which do not oppose each other. If we wish to climb a big mountain, we can get there by many different paths. It doesn’t matter which one we choose, but rather how we go about it. A concert of a children’s ensemble from the Art College.